The Pennsylvania Zebra and Quagga Mussel Monitoring Network is dedicated to protecting Pennsylvania's aquatic habitats from the threat of two harmful aquatic invasive species (AIS), zebra and quagga mussels. In the Great Lakes region alone, Ohio Sea Grant estimates that water users spend more than $30 million each year for treatments to control zebra mussels. These mussels clog water intake pipes and disrupt aquatic communities by filtering food that native species rely upon. After storm events, beaches are littered with sharp shells that can injure beach goers walking barefoot. Zebra mussels probably came to the Great Lakes in the ballast tanks of ships. They were first discovered in Lake St. Clair in 1988, and then found in Lake Erie in the late 1980's. In 1991, quagga mussels were found in Lake Erie. Since then, invasive mussels have spread and become established in several inland lakes and rivers in Pennsylvania. See the complete timeline for zebra mussels and quagga mussels in Pennsylvania at the USGS web site. Interested in helping to protect Pennsylvania's lakes, rivers and streams? Want to get outdoors more often? Or are you already working in the field and want to help out? Become part of the solution; join the Pennsylvania Zebra and Quagga Mussel Monitoring Network. To get involved, contact invasivespecies@psu.edu or call Sarah Whitney at 610-304-8753. How do zebra mussels and quagga mussels spread to new locations? In Pennsylvania, it is illegal to possess or transport zebra and quagga mussels. 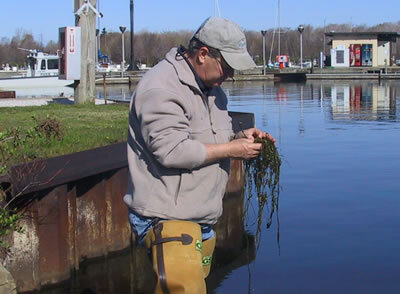 However, in most cases, people spread invasive mussels without knowing it. Both mussels can survive out of water for up to five days, making it easy for them to be carried from lake to lake on recreational boating equipment, fishing gear, and diving equipment. Adult mussels canattach to boat hulls, trailers, motors, vegetation and equipment left in the water using sticky fibers called byssal threads. In their youngest form the microscopic larvae, called veligers, can move to new locations naturally by floating along in a water body for up to 4 weeks. View an online interactive ArcGIS map showing all the zebra and quagga mussel monitoring reports in Pennsylvania. This map can be viewed in any web browser, and layers can be turned on and off to show presence or absence of invasive mussels. Clicking on colored pins will show specific information about each of the sites. The zebra and quagga mussel monitoring protocols were designed to provide a practical and efficient technique to track the population dynamics and range of mussels. These protocols provide information on prime areas to search, searching techniques, and what to do if you find zebra or quagga mussels in your area.